It rained today in NE Ohio. It has rained a lot lately. The ground is saturated. Farmers complain they can’t plant their crops. The crumbling roads are lined with puddles concealing mysterious hazards: potholes, debris. We had to proceed slowly and carefully. It was a cold, hard day to ride a bicycle. Soon after we left, we had to wait in the rain for almost half an hour as a train was “broken” to allow the locomotive to pull a few cars to unblock a highway. The train, bearing 18,000 tons of coal, was too heavy for the locomotive to pull up a wet track. 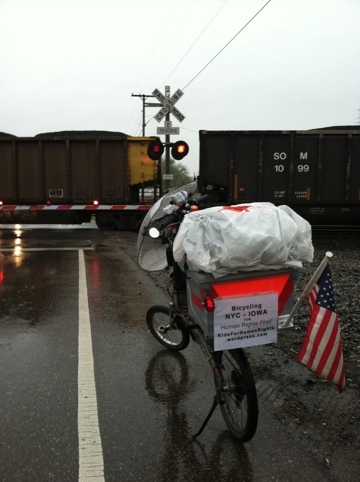 I’m not in the photo; I was well wrapped in the duffel bag strapped to the BikeE cargo box. Jeffrey was outside, getting a first dose of discomfort that would last all day. In late morning, to thaw a bit, we stopped in at a fast-food restaurant. Jeffrey’s garb and the BikeE attracted the usual raft of questions. He had a nice conversation with some of the regulars. As usual, at the mention of refugees, someone made a harsh remark. And as usual, when Jeffrey explained how Human Rights First helps victims of persecution explain themselves, let the chips fall where they may, the comments softened. When the conversation gets away from easy slogans, Americans get the point. Ohioans were friendly and quick to offer help as we made our way over back roads and asked for directions at a feed store, a bar, and by flagging down motorists. After a mere 47 miles that took all day, we were warmly received by old friends in Kent, Judy and Peter Mohan. 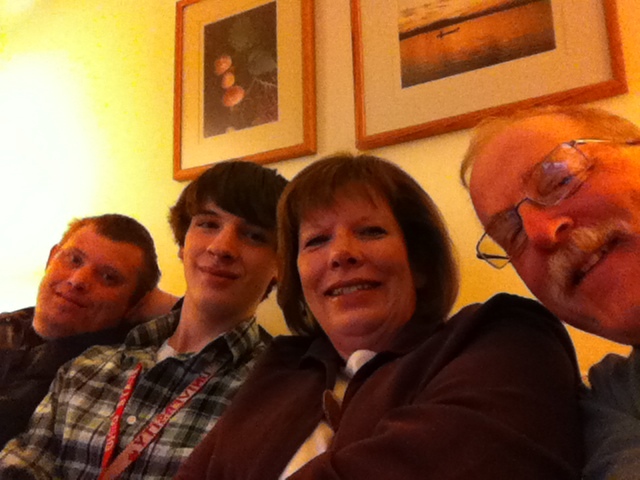 Here’s a photo of (right to left) Jeffrey, Judy, and two of her children. It’s a nice break from the loneliness of hotels. 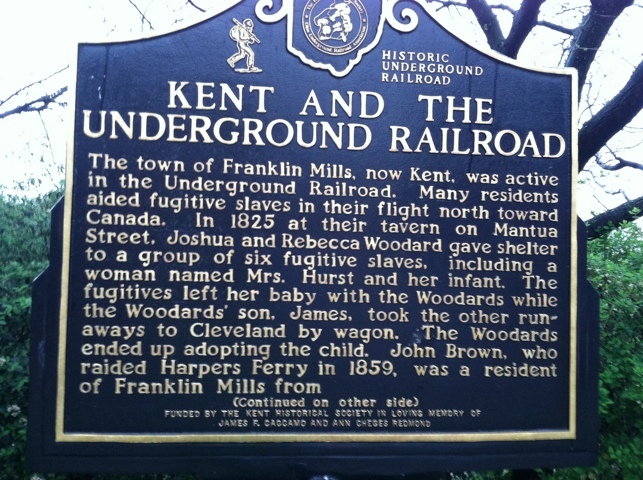 Below are photos of a plaque commemorating the local branch of the Underground Railroad, and of an historic waterway that Peter helped rehabilitate. This is the eve of the 41st anniversary of the Kent State shootings. We drove to the campus to see the site. That incident, and the Underground Railroad plaque, raise some questions. At Kent State, four students were killed — one of them while walking to class — and others were injured by National Guard soldiers. No one was held responsible for these shootings of American citizens, so the shootings seem to have been deemed acceptable under our law, even while the incident is regarded as tragic, an embarrassment. Contrast this with how we today celebrate the activists who operated the Underground Railroad. They were helping people escape slavery at a time when slavery was legal, slaves were not American citizens, and it was mandated by the Constitution that escaped slaves be returned to their masters. Who were acting lawfully, the National Guard soldiers or the Underground Railroaders? Who are honored today, and who pilloried? It’s something to think about when we consider the meanings of legal and illegal, right and wrong. 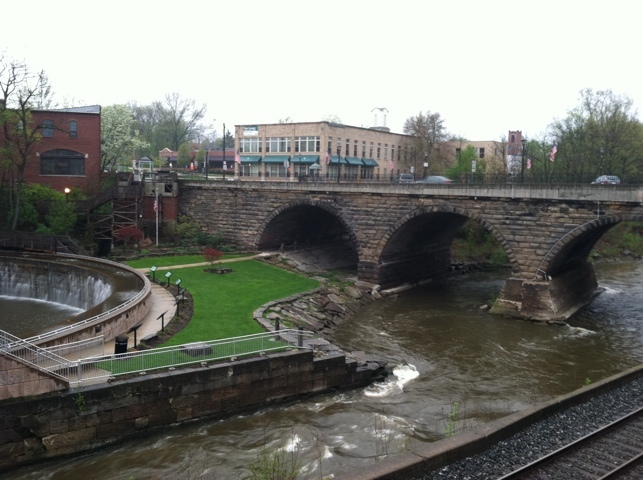 This entry was posted in Bicycle Touring, Human Rights and tagged Kent State, Underground Railroad by Joey. Bookmark the permalink. Wow, so many states done already! Good pedaling, Jeff! But I hope you wear your helmet straighter in Ohio than the picture of you at the Ohio/PA border – sheesh, that’s no head protection. 🙂 Best of luck! Don’t worry! The helmet was tilted for cosmetic purposes only. Plus, when actually cycling it’s tighter; it’s fitted over my Illinois Pork cap. great word about legal and illegal. keep safe.